In March, my partner Alex and I went to see the March for the Alternative parade and rally in central London, which was organised by Britain’s Trades Union Congress (TUC). Up to half a million people gathered for the event, to protest against the UK Coalition Government’s plans for fast and deep cuts in public spending. Never having been to a march like this before, I didn’t know what to expect. I was pleasantly surprised and impressed by the TUC’s organising. I first listened to several speakers at the rally in Hyde Park, hearing their passion at how they believe the cuts will damage the British economy. The tens of thousands of protestors present in the park weren’t just a bunch of students, but included children and pensioners. It was like a family day out. It is obvious that the government cuts will affect us all, black and white, rich and poor, young and old, employed and unemployed. The protestors were representative of each of the home nations: England, Scotland, Wales and Northern Ireland. People were in Unison” with each other, truly wanting to “Unite”, as were the two namesake unions, the biggest two in the UK with over a million members each. I wrote in the last issue of The Regent, that the budget cuts of the Conservative and Liberal Democrat coalition also affected the arts. As an artist, I was keen to show my support for the British Actors’ Equity Association and The Writers’ Guild of Great Britain, which were taking part in the demonstration with many other affiliated unions. I saw firemen, nurses and teachers coming together as one for a common purpose. A large gathering inevitably provides the opportunity for disturbance and unfortunately the end of the TUC parade was not exempt. A small group of protestors not connected to the main march decided to cause damage to businesses along the route and confront the police. The mood of the parade changed dramatically from one of peaceful protest, to one of violence on the capital’s streets. One of the targets of this small but effective group was the exclusive store, Fortnum and Mason. The protestors not connected to the peaceful march took over the store, with some getting up on the roof just above the main entrance, to cheers from the crowd. Among those clapping and cheering were two well-dressed middle-aged men. After a short while, I approached them and asked why they were showing support for what was now going on. One of the men said, “Fortnum and Mason represents everything which is bad about this country and the privileged.” I was a little surprised, to be honest, and this highlighted the widespread anger towards the cuts among many groups. No reasonable person condones violence against property or people, and neither do police officers on duty. Sadly though, many see the police as representing the state and take their anger out on them along with the institutions like banks that many feel are to blame for the mess the economy is in. As the riot police moved in, the viewing public quickly left the area. When I got home, I switched on the news to check how the unrest had developed and it was disappointing to see BBC News focus mainly on the behaviour of this small group of people, rather than the half a million peaceful public sector workers who took to the streets. The BBC should not air its opinions across its news channels. I remember watching its rolling news coverage of the student protests last year against tuition fees and a particular interview with a disabled protestor made for uncomfortable viewing. Apart from being a public corporation, the BBC should be unbiased and leave matters of guilt or innocence to the courts. 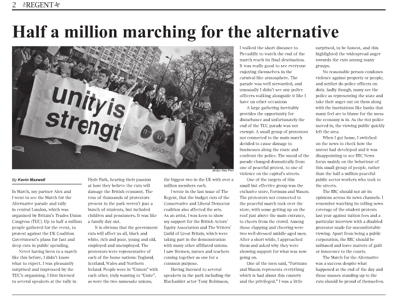 The March for the Alternative was a success despite what happened at the end of the day and those masses standing up to the cuts should be proud of themselves. Published by The Regent newspaper Summer 2011. ← HATE is so second-rate…!